Is Republican gubernatorial candidate and State Treasurer Walker Stapleton consolidating support in the final stretch before Saturday’s GOP Assembly? ICYMI, PeakNation, earlier this week Stapleton, who was set to get on the ballot via petition, tossed his petitions after the firm that collected his petitions allegedly was not honest about the eligibility of one of the signature gatherers. 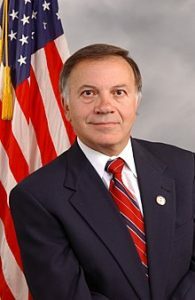 Today, Stapleton has earned the support of former Republican Congressman Tom Tancredo, a favorite among the grassroots for his outspoken character. Given Tancredo’s popularity among the grassroots, this could be a game changer at the Assembly and certainly changes the dynamics on Saturday, which already were in upheaval given Stapleton’s re-entrance into the assembly process. It’s hard to tell who will come out of the Assembly process and make the ballot. Attorney General Cynthia Coffman was a front-runner before this week. Barry Farah was another possibility, but Stapleton’s entrance into the process means it’s every man (or woman) for themselves. Of course, there also is the possibility of a nomination from the floor. It’s anyone’s guess what happens on Saturday.